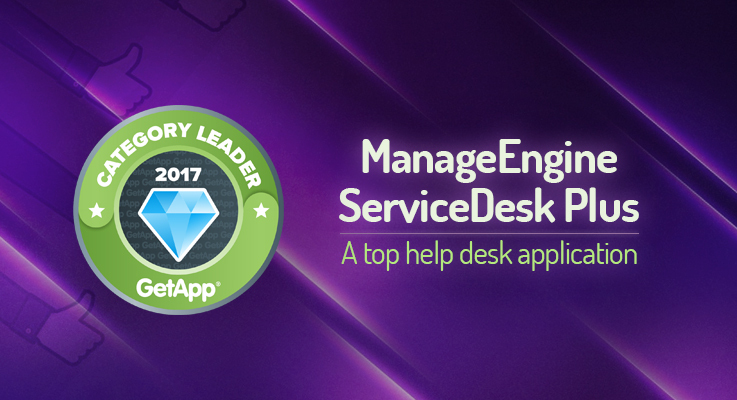 GetApp, a trusted web-based service that helps organizations identify the best apps for their business, recently placed ManageEngine ServiceDesk Plus in its list of top 25 help desk and ticketing apps. In a recent survey, GetApp used five factors—capabilities and integrations, user reviews, mobile app availability, media presence, and security—to identify the top help desk and ticketing apps hosted in the cloud. GetApp’s ranking is sure to help business owners assess help desk and ticketing software and choose the best fit. Each factor was analyzed and scored out of 20 points, which paved the way for accurate comparison and pointed out the best features of each app. ServiceDesk Plus, available both on-premises and in the cloud, was identified most for its mobile app availability, media presence, and security categories. With a wide range of native and third-party integrations, this cloud-based app reaches out to many ITSM processes and beyond. See for yourself why ServiceDesk Plus was ranked one of the top 25 help desk and ticketing apps by signing up for a free, 30-day trial. Learn more about ServiceDesk Plus’ features and pricing. Read GetApp’s survey here.